The Webster Apartments, nicknamed the Spinster by my husband, has changed little since it opened in 1923 in Hell’s Kitchen, sandwiched between 9th and 10th avenues on 34th Street. Men are not allowed above the ground floor and are forbidden from staying overnight in this New York City institution founded by Charles and Josiah Webster to provide a subsidized, genteel home for young women getting their start in the Big Apple. The Websters were first cousins of Roland H. Macy, whose namesake department store — still billed as the world’s largest — is located just down the street. Nowadays, the Webster is home to hundreds of women who flood into the city every summer to work — often for nothing or next to nothing — in internships at some of the most prestigious foundations, arts institutions and businesses in the United States. But it’s also home to women who live at or near the poverty line. 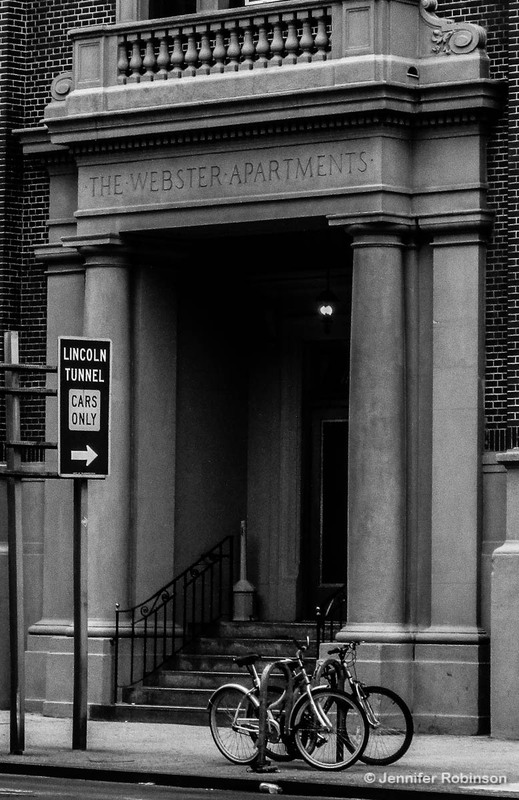 In fact, one legendary resident, now in her 80s, has called the Webster home since arriving in the city in the 1960s. Getting into the Webster is not easy. At least, it wasn’t for me. I needed my own Miracle on 34th Street! When I learned I had been chosen as an intern by the William J. Clinton Foundation last spring, I immediately tried to get in touch with the Webster after it was recommended to me by Julie Becker, the head of the foundation’s internship program. 3.) It was an incredibly low $285 weekly for room and board! If you’ve ever tried to find a place to live in the Big Apple for the spring and summer, then you understand how time was of the absolute essence in this matter. Competition is fierce, especially for room and board in the heart of Manhattan at that bargain price! At the time, I was studying for my master’s at University College Dublin in Ireland and had the time difference working against me, as well as the fact the staff at the Webster don’t use email or web-based application forms to communicate with potential guests. In fact, all correspondence is typed on an electric typewriter. To be considered as a tenant, I had to first call and ask them to FAX(!) me a room request form. The foundation also had to write a letter on my behalf to prove I was an intern and not being paid for my services, which enabled me to qualify for the Webster’s $285 weekly rate, and I had to send a cheque for $50 US as a room deposit. Of course, this meant I had to mail my room request form, the foundation letter and the cheque from Ireland to New York. A further wrinkle for me was that Irish banks don’t sell traveller’s cheques (too many cases of fraud) and of course I had no personal cheques with me in Ireland since I had no reason to use them there. Aha! I thought. I’ll send a $50 US bill instead. Eventually, I just sent the entire package with the cash by regular mail at the famous General Post Office on Dublin’s O’Connell Street. It was much cheaper anyway and arrived in New York just three days later. Of course, those three days meant the difference between getting in and not getting in. In a panic, I had to settle for more expensive accommodation through Educational Housing Services at their 1760 3rd Ave. location. This turned out to be a blessing — I roomed with two wonderful women, Gretchen and Megan, and had the opportunity to walk every morning down Museum Mile into Midtown. Nothing beats that 60-minute walk down Fifth Avenue! 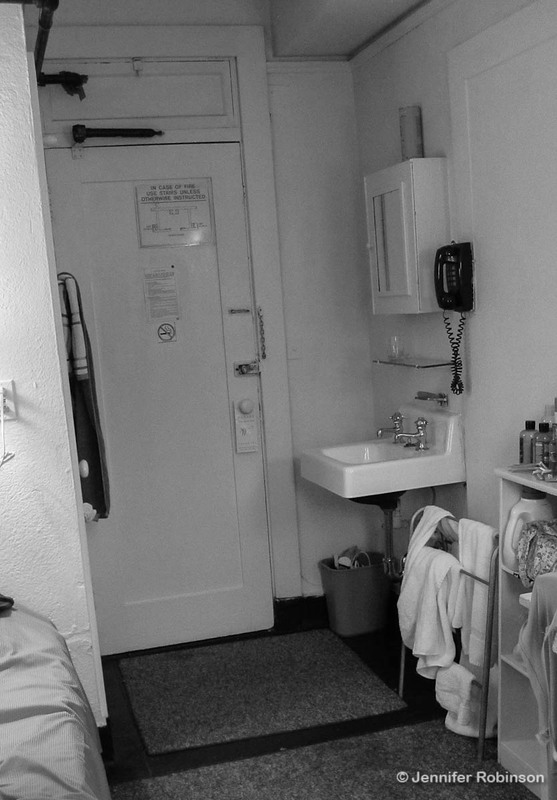 In mid-August, I finally moved into the Webster when my accommodation on 3rd Avenue ended. In two days, my dissertation was due and I still had 14,000 words to write! Flustered, hot and panicked — that’s how I arrived at the Webster. The clock was ticking. I needed to get to my room ASAP and pound out my thoughts on my trusty laptop in order to pass my final paper in on time. But the staff at the Webster are old fashioned and don’t like to be rushed when they’re explaining the house rules. I was practically dancing as the lady behind the counter droned on and on. At one point, I asked a question about accessing the Internet, interrupting her. She looked at me and I could tell I had derailed her whole rehearsed speech. I immediately apologized for “interrupting her flow,” which made her and the other lady behind the counter crack up. Thank God, she let me go then. But alas, the lady with the gravelly smoker’s voice who showed me to my room wanted to give me a tour. I can’t tell you what a Herculean effort it was to convince her I could find my own way around eventually. But right now I needed to work! When researching the Webster, I had read quite a few negative reviews online about the staff. In my case, they were wonderful. They are true New Yorkers — gruff, no-nonsense types with hearts of gold. And after I had made them laugh, I could pretty much get away with anything. A sense of humour really does go far in this world. The rooms at the Webster are a good size for a person who doesn’t intend on spending much time there. It is New York after all. There is a sink, telephone, desk, chair, large closet, and a twin bed. Bathrooms and showers are shared and are just down the hall. The building also has laundry rooms, two TV rooms, a computer room, musical room (complete with piano), a large cafeteria, backyard garden, and Art Deco-styled private rooms on the main floor named after fabled stars from Hollywood’s golden era (think Valentino, Dietrich and Garbo) for entertaining guests. Above the tiny wooden desk is a mirror. Strangely enough this mirror was comforting as I dashed through my thesis. I’d look up every now and again and peer into my own eyes to see if I could see the desperation there. I could. I’m a newswire trained journalist. I thrive on pressure and a pressing deadline. In fact, I often can’t bring myself to write quickly without one. It’s a bad habit but I’m a total adrenalin junkie. Although the Webster is a 13-storey building with 373 guest rooms, it is most often as quiet as church at night. Street noise in the summer is a bit of a problem but if you turn on the fan above the bed it’ll drown everything out. Another great thing about the Webster is that it’s almost directly across the street from a 24-hour diner. Coffee, cookies and grease at any hour — it’s a student’s dream. 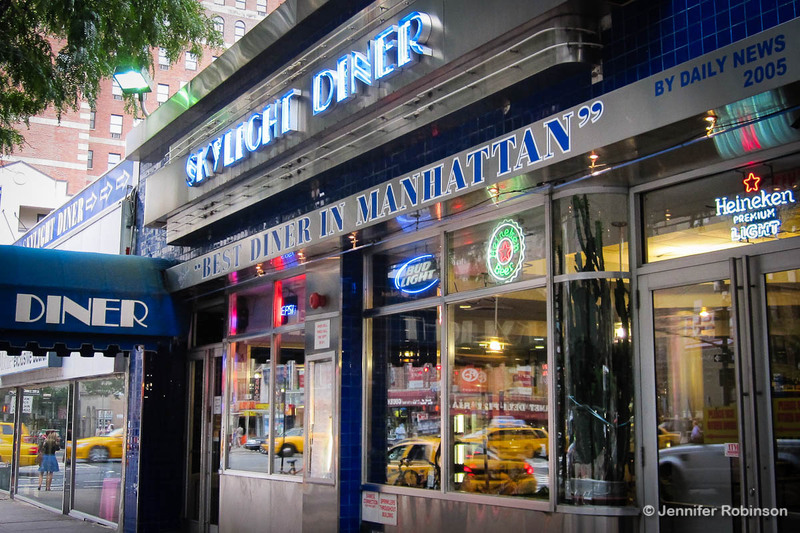 Fuelled with java from the Skylight Diner, I finished my dissertation with four minutes to spare. Talk about cutting it close! The Webster is home to an eclectic group of people. The lobby is usually sprinkled with the young interns, a surprising number of which are from Germany, while in the cafeteria the longtime residents are most visible at meal times. Along with the house rules of the Webster are the unofficial rules of these older ladies. I had the misfortune of breaking one of these invisible rules at chow time one night. I was starving after a long day at the office and plunked down my tray in one of the middle tables in the cafeteria that has a view of the garden outside. There was a key on the table, which I thought had been forgotten by the previous occupant. “OK,” I said. “Well, you and your friend are welcome to join me.” She grunted “no” and stalked away, unimpressed by my lack of knowledge about the mysterious ways of the Webster. It was a surreal and funny moment. I felt like I was in a prison movie and had pissed off one of the inmates. I kept an eye out for a shiv fashioned out of one of the plastic soup spoons but none materialized. In general, the residents are not friendly but they’re not usually unfriendly either. The lifers eat together, the newbies cluster together and the smokers hide out on the rooftop deck. I think the newbies don’t mix with the oldies because they secretly fear them — no one wants to be in their 50s and still living in a place like the Webster. The best place to escape the concrete jungle and all the noise of living with a bunch of women is up on the roof. 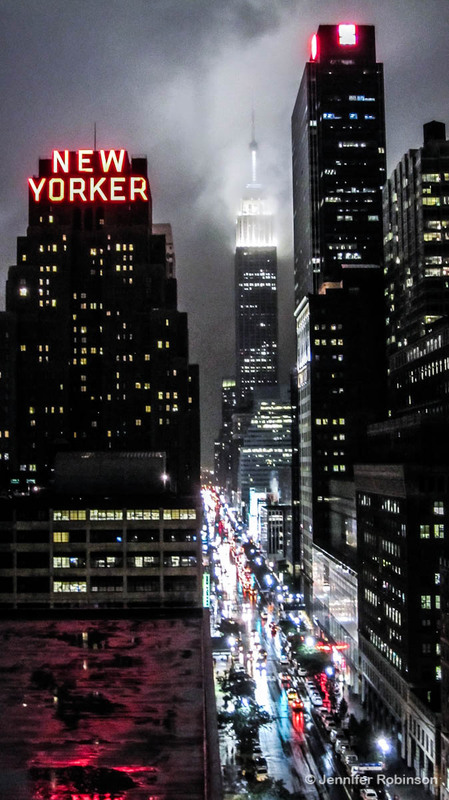 The top of the Webster offers an unblocked view of the New Yorker Hotel and the Empire State building. This is the place to watch the lights of New York come on as the sun sets. Aside from the cluster of smokers near the elevator, there’s usually no one up here. As a result, it offers the sensation of being wonderfully alone right in the heart of the city amidst the millions of people who call New York home. Living at the Webster for a month and a half was a great experience. Although dealing with its outmoded ways was challenging and maddening in the beginning, by the end of my stay I was thoroughly charmed. One of the best things about New York City, in my opinion, is that it is able to maintain these little gems of the past while being at the forefront of change. There is room here for everyone and everything. Where else could I get a perfectly typed phone bill for 15 cents, while paying $30 for a spotty Internet connection? Or pay — in cash — my monthly rent at an old fashioned brass banker’s wicket?